Haiku as social commentary: this innovative book appeared, without attribution, at Haiku North America in New York in 2003. It’s message has become only more urgent in the decade that has followed. 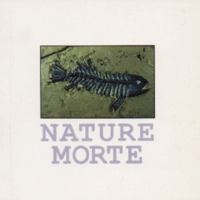 Anonymous, “Nature Morte,” The Haiku Foundation Digital Library, accessed April 25, 2019, http://www.thehaikufoundation.org/omeka/items/show/174.